Step 1 Trim the tops off the carrots, pick all the fronds and discard the stems. Wash, dry, and finely chop the fronds. Step 2 Scrub the carrots under cool running water and lay out to dry. Take two carrots and slice or shave thinly lengthwise and store in ice water. Step 3 Mix the Gochujang, olive oil, and grated garlic. Step 4 Set a grill on a low heat or wait until your coals have burned down to a mellow low heat. Brush the whole carrots with the chili oil mix and place over the heat. Grill slowly for about 40 minutes turning often and occasionally brushing with the chili oil mixture. They are finished when they are completely tender (poke with a thin metal skewer or eat one) and lightly charred. Step 5 Remove the carrots from the heat and sprinkle liberally with the chopped carrot greens, fried shallots, and a little Maldon salt. Drain the shaved carrots and dress in a bowl with a touch of the chili oil, a splash of white wine vinegar, a large pinch of chopped carrot greens, and some Maldon salt. Step 6 Arrange two-to-four carrots (depending on size) on each plate. Garnish with three-to-five shaved carrot curls and a few shards of pecorino cheese (shaved with a vegetable peeler). 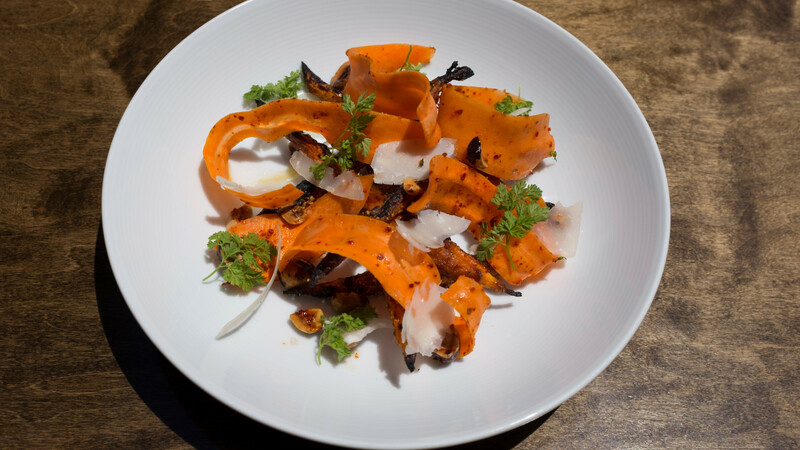 “I love these carrots,” says Executive Chef Phillip Kirschen-Clark of The Milling Room, a high-ceilinged den of luxurious (mostly) shared plates in New York City. “The slow grilling really concentrates the carrot flavor and creates a lovely dense and tender texture almost like a fudge.